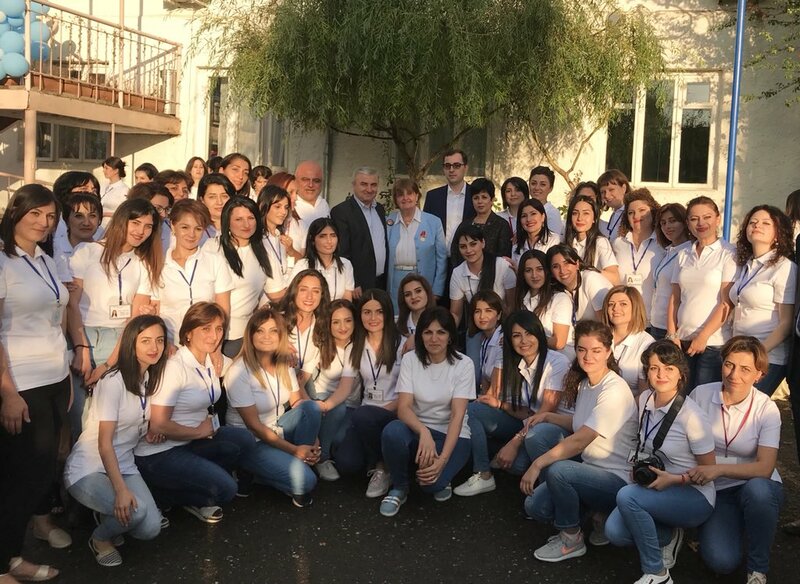 Members of the HART team recently returned from celebrating the 20th anniversary of The Lady Cox Rehabilitation Centre in Stepanakert, Nagorno-Karabakh with its founder, Vardan Tadevosyan and his committed team of health workers. Fighting against a culture that kept people with disabilities behind closed doors, Vardan and his team now treat over 1,600 patients a year with therapeutic services such as physiotherapy, speech therapy and occupational therapy. A historically Armenian region in the South Caucasus, Nagorno-Karabakh found itself placed within Azerbaijan in 1923 as a consequence of Stalin’s divide-and-rule policy. As Soviet rule collapsed towards the end of the 1980s, Armenian-Azeri tensions increased. War erupted at the hands of Azerbaijan in 1991 and resulted in the death of 30,000 people. In 1994, a ceasefire was brokered and ethnic Armenians have since established Nagorno-Karabakh as a de facto independent state, though its independence is not internationally recognised. However, in April 2016 a four-day war broke out killing over 200 soldiers and several civilians. The HART team met with David Tonoyan, Defence Minister of Armenia who stated that “tensions are increasing” and “Azerbaijan is advancing”. Judith Farnworth, UK ambassador to Armenia also told the HART team that “it does not inspire confidence that Azerbaijan isn’t prepared to engage seriously in negotiations”. All the politicians and religious leaders that the HART team met with during the visit expressed Nagorno-Karabakh’s primary concerns as peace and security, yet each recognised the imminent threat of another war with Azerbaijan. Masis Mayilian, Minister of Foreign Affairs in Nagorno-Karabakh stressed that security is very important, stating that “international recognition would make us as secure as possible”. The HART team was also privileged to meet Armen Sarkissian, President of Armenia to discuss UK-Armenian relations and HART’s on-going support for Nagorno-Karabakh. Despite the UK Government not yet recognising the 1915 Armenian Genocide, the President stressed that the “general mood is positive” with a “feeling that the UK wants to do more”. The HART Team was overwhelmed to see the tremendous progress that the Centre has made over the last 20 years. With the number of staff being trained, new treatments available and accessible facilities increasing each year, the Centre has significant potential to expand its therapeutic services to all those with disabilities in Nagorno-Karabakh. However, as the only disability rehabilitation facility in the region, continued support of Vardan’s Centre is crucial. Constraints in funding and space limit the provision of care for the disabled to only 10% of those who could benefit. Additional funding would assist in establishing a new Centre on the outskirts of Stepanakert to provide for patients needing more outdoor space, as well as provide basic training for families of the disabled so that specialist care is available at home.